Nature is an expert at efficiency — from the cycle of water through the atmosphere, soils, tributaries and creeks to the life cycles of fish and fowl, there’s nothing that’s wasted in the natural cycle of the workings of the world. Fisherman Pete Haskell has a growing business, which includes tackle shops in East Quogue and Westhampton, sustainably caught seafood and charters, and he’s expanding this year in several other innovative ways that are right in tune with nature’s cycles. He’s partnering with the Bridgehampton School to bring fresh local porgy and potato fish sticks to their school lunch program, launching a Community-Supported Fishery share program with pickup sites at farm stands throughout the South Fork, and is perfecting the recipe for a fish-based plant fertilizer for gardeners. 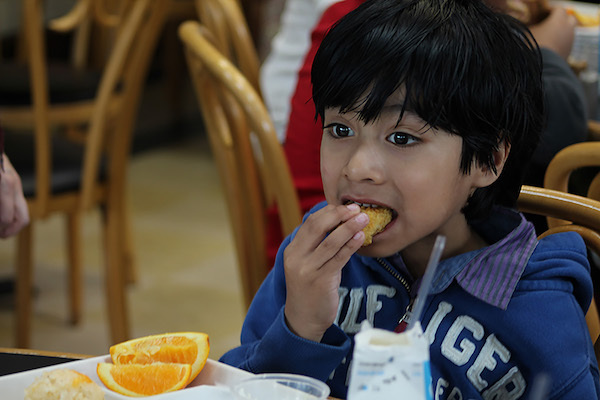 Last fall, in a conversation with Augie Ruckdeschel of the Suffolk County Department of Economic Development and Planning, Mr. Haskell began to develop the idea of bringing fresh-caught fish to the East End’s schools. Mr. Ruckdeschel introduced him to the Farm-to-School coordinator for the Bridgehampton, Tuckahoe and Southampton School Districts, Marissa Silverberg. Typically, school districts are required to put lunch contracts out to bid and accept the lowest bid, regardless of the quality of the food. 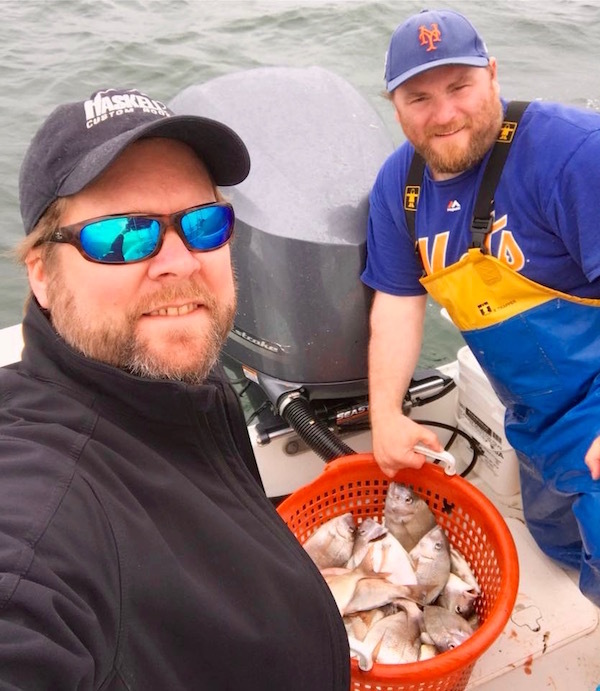 Mr. Haskell also been partnering with Peconic Baykeeper Sean O’Neill, whose focus has been on education, with help from a bumper crop of huge porgies in the Peconic Bay this spring. 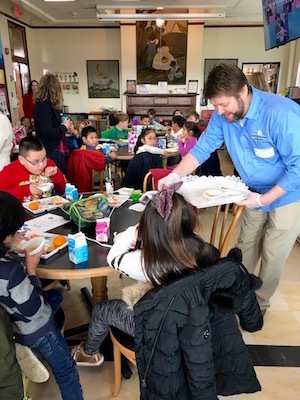 “It’s a key moment to introduce seafood, so students develop a taste for seafood,” said Mr. Haskell on a recent trip to deliver the fish sticks to the Bridgehampton School. Student photographer Estefany Bonilla was among the students who documented other students at a tasting at the Bridgehampton School. The project began with a fish stick tasting in late 2017 with students from both the Bridgehampton and Southampton schools. “The students all filled out surveys, and they were so positive, that we really feel we made an impact,” said Mr. Haskell. 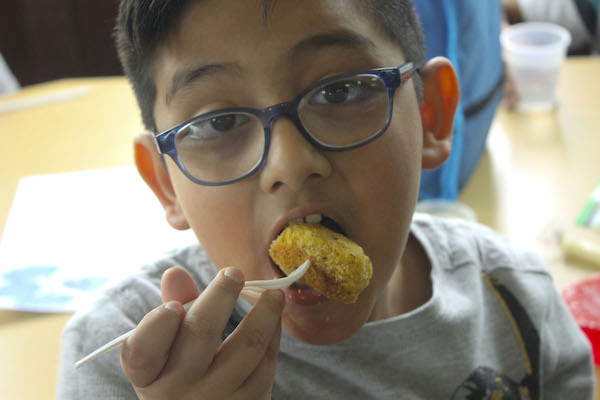 The Bridgehampton School has begun a program this year called New York Thursday, a once-a-month school lunch sourced from New York State, in which the district’s chef, Dan Pacella, prepares a full menu incorporating the porgy-potato fish sticks. Student photographer Jordan Grant was among the students who documented other students at a tasting at the Bridgehampton School. “It’s all about synergy. To connect the dots, to me, is the best feeling. It’s a great example of a community coming together,” said Mr. Haskell. That synergy extends to his other projects. This June, Haskell’s Seafood is launching 100 shares of a Community Supported Fishery program, similar to Community Supported Agriculture, in which participants pay at the beginning of the season for a share of the fisherman’s catch, and then pick up their share on a weekly basis. Mr. Haskell has partnered with The Milk Pail in Water Mill and Hampton Fruit and Vegetable farm stand in East Quogue, and a pickup spot is in the works for Amagansett, where participants will be able to pick up their shares each week, allowing them to chose a pickup site near them to avoid sitting too long in the dreaded South Fork summer traffic. The items in each share will be sustainably caught, in-season fish, with three components: freshly filleted fish, a seasonal seafood salad, and a prepared island such as baked clams or clam chowder. The program runs for 14 weeks, from the first week of June through the first week of September, with shares for two or four people ranging from $60 per week for two people to $120 for four people, or $840 to $1,680 for the season. Registration forms are online at www.haskellsseafood.com/haskell-landing-page. Furthering the linkages between the food cycle, Mr. Haskell gives his leftover clamshells to the Shinnecock Bay Restoration Program, which uses them to create the substrate for oyster reefs. And he’s working this spring to standardize his method of making fish fertilizer from what’s left of the fish after they’ve been stripped of their meat. He’s planning to sell the liquid fertilizer in 16 and 32 ounce bottles of concentrate, which can be mixed at a 50-1 ratio. Mr. Haskell and Mr. O’Neill are also working together on a Peconic Baykeeper aquaculture incubator site in Great Peconic Bay, with 10 five-acres underwater parcels for oyster growers. Mr. Haskell is helping the growers to brand their value-added products. “There are three components I think are most important — carbon footprint: you want to buy your food locally to reduce transportation expenses; sustainable fishing methods, like hook and line; and the type of fish caught and using underutilized fish,” said Mr. Haskell. And that’s how one local businessman is connecting the dots between the climate, our future, and our local economy.